Carbon fiber is perhaps one of the coolest product materials out there. If your product is made with real carbon fiber, you instantly add masculine, technical appeal, not to mention durability. While Bluetooth headsets are a necessity for most businesspeople in fast-paced environments, we wouldn’t exactly say they have much of a cool factor. Until they are small enough that we can simply touch our ears to answer a call like spies on TV, Bluetooth headsets aren’t high on the list of coveted tech accessories. Combine the two and you may not have the most futuristic must-have, but you do have the very first carbon fiber Bluetooth headset by Bluetrek, ($70). It’s not the most eye-catching design we’ve ever seen, but Bluetrek’s use of carbon fiber makes this headset extremely lightweight and thin, a combo that is appealing for any avid user. The headset features Bluetooth 3.0, Noise Lock noise canceling, easy pairing, advanced voice prompts, and a battery status readout that appears on your iPhone. Multipoint technology also allows user to connect to two different Bluetooth devices simultaneously. 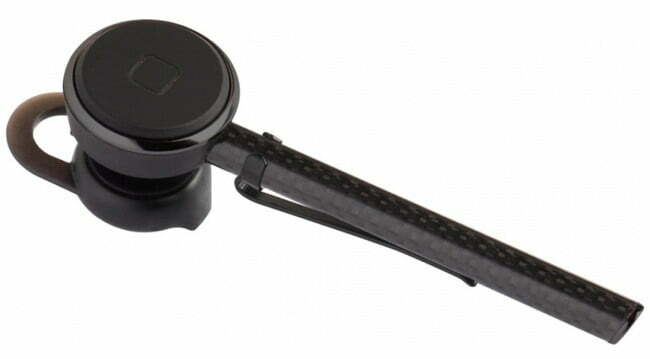 The headset comes with four different size earbuds, making that annoying ear-hook attachment unnecessary.